JE Ralph shares his views on segregation in the Bureau. Digital copy acquired from federal archives by previous WWPL Archivist, Heidi Hackford. 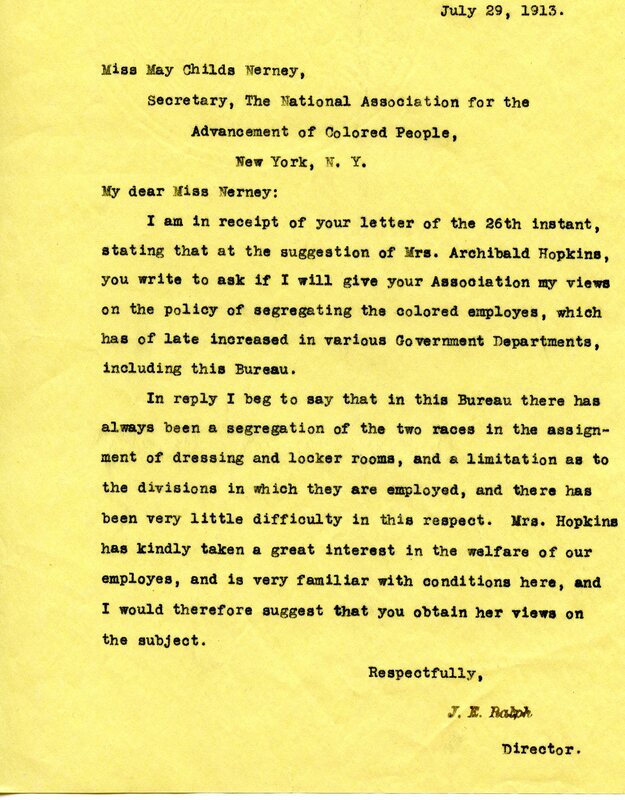 I am in receipt of your letter of the 26th instant, stating that at the suggestion of Mrs. Archibald Hopkins, you write to ask if I will give your Association my views on the policy of segregating the colored employes, which has of late increased in various Government Departments, including this Bureau. 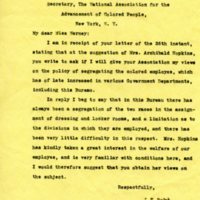 In reply I beg to say that in this Bureau there has always been a segregation of the two races in the assignment of dressing and locker rooms, and a limitation as to the divisions in which they are employed, and there has been very little difficulty in this respect. Mrs. Hopkins has kindly taken a great interest in the welfare of our employes, and is very familiar with conditions here, and I would therefore suggest that you obtain her views on the subject. Ralph, Joseph E., 1863-1922, “JE Ralph to May Childs Nerney,” 1913 July 29, SE072613b, Race and Segregation Collection, Woodrow Wilson Presidential Library & Museum, Staunton, Virginia.